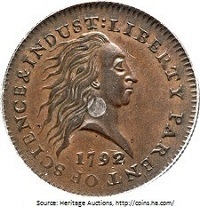 I just read news that a 1792 US silver center cent sold for $1 million at a recent Heritage auction! * A pattern with a known population of less than a couple dozen, it’s one of the most extreme example of the relative impossibility of estimating coin values I’ve ever seen. It’s an ugly coin, to be sure. The Leopold Taler I wrote about some time ago is also quite ugly, but it at least presents what we believe is a fairly accurate portrait of a real historical figure, and was a forerunner to the silver crown/trade dollar that was widely imitated and used for trade around the world. The silver center cent, on the other hand, presents a conceptual figure, Lady Liberty, so poorly executed that she resembles a hairy troll. (But perhaps not far from Delacroix’s portrayal, come to think of it.) It never entered production and was never used in commerce or in any other capacity. Nevertheless, the cataloguer described it as being “…the single most significant and historically important coin ever produced at the Philadelphia Mint!” Its rarity alone apparently drives the price; otherwise, I have no idea how anyone could arrive at a value of $1 million for this cent. An agreed-upon correlation between traditional grading values (e.g., F, VF, EF/XF, etc.) and the Sheldon Scale (0 to 70, where 12-14 = F, 25-30=VF, 40-44=EF, etc.) in the coin collection community. This isn’t always the case; since posting I’ve heard at least one opinion that truly uncirculated doesn’t begin until somewhere around MS 64. More on this another time. Other than a note that other values exist, an implied acceptance of the values for each grade found in the 2012 SCBC. This was assumed just to get on with the business of providing a construct for interpolating between values for each grade, regardless of whether you consider the values to be valid. Good grief, the high value, $1309, is over three times the low value! There’s almost no point to having price guides, is there? I guess they are of some use, though. If you’re a buyer, you can plan on paying closer to the high value; maybe even a little higher if it’s a rarity and/or if it’s at auction and the bidding is sharp. If you’re a seller, you have to be aware that in an auction, you may wind up with the low value, or even less if no one is paying any attention. This entry was posted in Coins, News and tagged grading coins. Bookmark the permalink.